With so many camera lenses out there, how do you find the best ones for food styling photography? You can think about photographing food as if you’re taking its portrait. As such, you want to have a lens or two that shows off the beauty of your food subjects. Consider using a range of normal to slightly long focal lengths, centering in on the 40mm to 85mm neighborhood. This range produces amazingly delicious food images. 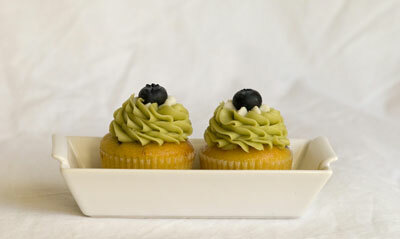 This “portrait” of a pair of cupcakes was shot with an 85mm lens. Whatever lens you shoot with, using a clear protection lens filter is a really important must for your lenses. These filters protect the surface of your lens from scratches, dust, fingerprints, and the like. When you buy a lens, consider the focal length (mm), a fixed lens versus a zoom lens, and the f value of the lens. Generally, the lower the f value (such as f/2.8), the higher the price and quality of the lens. The longer length of an 85mm lens can create an awesome background blur for food images, but you may have to shoot much farther away from the subject than you might want to. Another factor to consider when shopping for a lens is the weight of a lens. Some beautiful lenses have magnificent optics and yield fabulous photos but are difficult to hold for extended periods of time. So you may choose to use the heavier lenses for shorter periods of time, interspersed with a trusty, lightweight zoom that you can use to handle a lot of images. A lens that has both a manual focus option and an autofocus choice is the best of both worlds. Having the flexibility to choose either focusing model really allows a photographer some leeway to hone in on the highlight in whatever way works best for a shot. But some lenses are autofocus only — a reflection of the ever more automated world we live in. If you love the quality of a specific lens that’s autofocus only, don’t fret! Manually choose the focus points within your camera’s focus settings to set the points exactly where you want the crisp focus in your food subject.